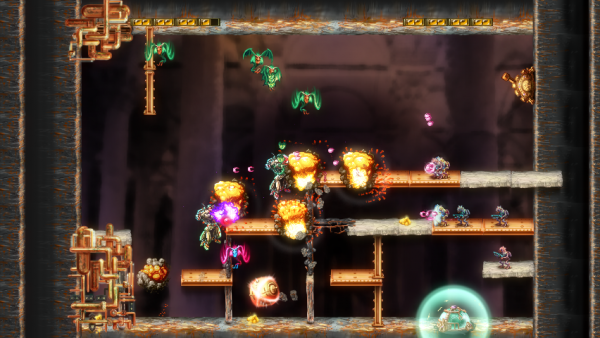 Explosionade, while causing a stir within the XBLIG developers community, is another release from Mommy’s Best Games. See if I keep reviewing Mommy’s Best Games, or schmups, you are going to start things that I either A. work for Mommy’s Best Games (I don’t) and B. Play nothing but schmups. Though, I am playing this XBLIG title until my xbox screams for me to stop, I might as well tell you why it’s worth the 80 Microsoft Points ($1). All your friends are storming the Horronym Fortress but Colonel Bouche left you to guard the supply depot. Disregarding orders to clean the toilets, you open the depot to find a gigantic, prototype mech! You jump into the mech, and you head down into the sewers for a little fun shooting things, only to find the Horrornym right at your back door. This game still pulls at the heart strings that love a nice classic retro 2D game. The art style is a little different from their previous title of Shoot 1Up, in that he uses more earth like tones, to make it feel more like the sewers of some faraway place. Also, there is a lot more story within this game, and the dialog is between characters is very tongue in cheek. You can see the time and attention to detail given to the animations. And he is right; it does bare a lot of resemblance to the SNK games of the past. The art style and effects leave me wandering down memory lane remembering a game like Metal Slug. The mix of game genres – While Explosionade isn’t a schmup per se; it does have some shoot’em moments when you just want to leave your machine firing all over the place. But there are platforming elements to the game, as well as some puzzles to solve. This is what makes it a very unique game. The puzzles, are solved by figuring out how to best use the abilities that you mech has to get from one place to another, which also plays into the platforming elements And most times, the puzzles are to get the most points out of the level as possible. When they were creating this game, they did put a lot of thought into how to make it a bigger challenge for those that are score junkies. 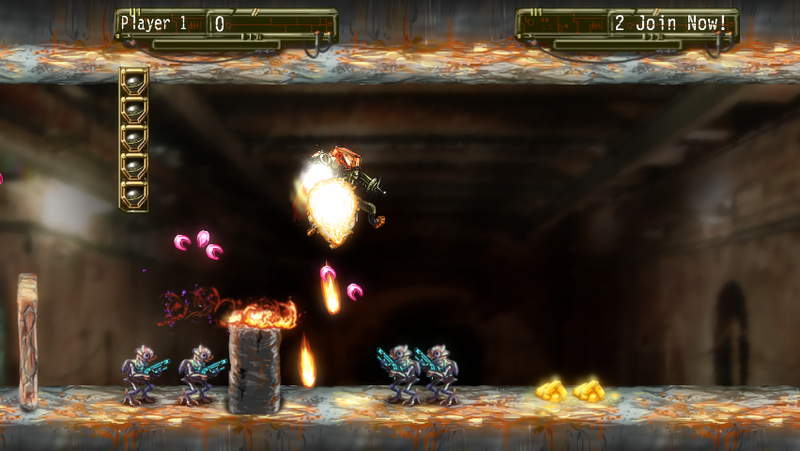 The shoot’em up is making sure that you kill all the baddies that are before you. They need to die, and you can choose how you want to kill them! Fill them full of hot lead from your machine guns, splatter them all over the destructible environments with you electrostatic grenades, or just stomp/kick them with the large legs of your mech. The choice is yours how you want them to be dispatched. The number of levels – There are 40 challenge room style levels within the game. 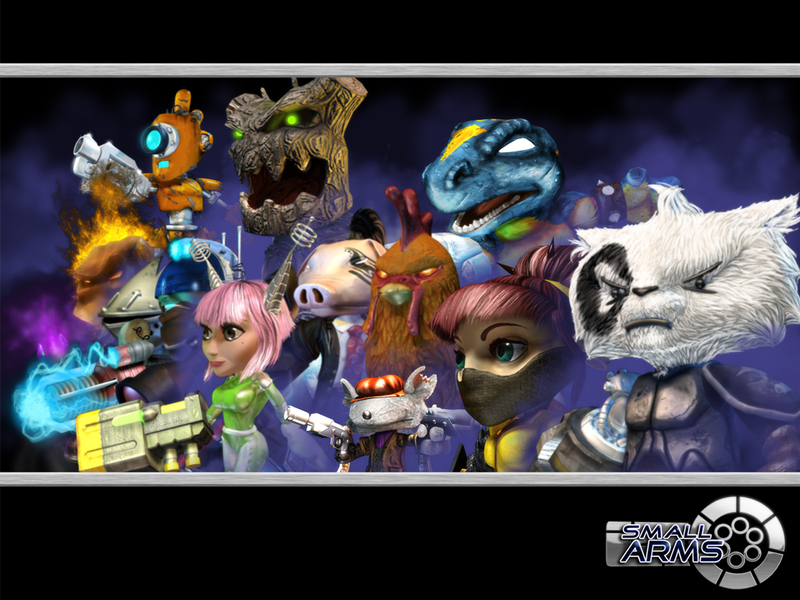 For a game that cost a dollar, that is a lot of level goodness for your money. As you go through the levels you also are given the choice of how you want the story to progress. There are two different endings to the game depending how you complete each of the 40 levels the game has to offer. The awesomeness of the mech – Instead of having one special ability, like most 2D games use to do, they combined all the awesomeness into one mech. They unleash you out into their world to unleash all sorts of havoc and chaos on the Horronym. I mentioned the machine gun and the grenades but just like in Shoot 1Up, the shield ends up being the weapon as well. You can shield burst and kill enemies with it as well as defend from all the bullets being fired off at you. You do only get a limited time using the shield before it has to recharge, so use it well. The shield can also be used as a bouncing device. Charge up the shield just before you hit the ground, and you bounce right up into the air higher and further than just jumping alone. The levels are short – I understand where MBG was going with the game when they set up the levels challenge room style, but I was hoping that they would be just a little bit longer. The game has a unique zoom in and out feature, which I thought would make the levels seem huge. I was kind of hoping for something large scale, kind of like you would find in Castlevania: Harmony of Despair. I will be honest that this is a minor issue I have with the game. Explosionade is much like its older brother Shoot 1Up. It’s chock full of goodness with achievements, and you would be a fool to pass it up. It’s price point makes it well worth the purchase despite the shortness of the levels.